On May 14, 1836, (some sources say May 17, 1836) Wolf (later changed to Wilhelm, and then to William) Steinitz (vil'helm shti'nits) was born to Jewish parents in a Prague ghetto on Goldrichstrasse or Goldrich Street, Kingdom of Bohemia and part of the Austrian Empire (now the Czech Republic). Steinitz may have been born with a clubfoot. All of his adult life he required the aid of a crutch or a walking stick. He was also short, and grew to barely 5 feet in height. The archives in Prague say that Wolf Steinitz was born on May 14, 1836. Steinitz wrote in his International Chess Magazine (June 1887) that he was born on May 17, 1836. Wolf (Wilhelm) was the 9th child of Josef Salamon Steinitz (1789-1865), a Talmadic scholar (but not a rabbi) and tailor. Wilhelm's mother was Anna Steinitz (1802-1845), nee Torschowa or Torshova. Four more children were born after Wilhelm Steinitz, but they all died in early childhood. One of his older brothers was Salomon Steinitz (1829-1884). The original first name for Wilhelm Steinitz was Wolf Steinitz, which he changed to Wilhelm after he left Prague. Wolf is an old Jewish name. Steinitz liked to say that he was the 13th child, but he was not. After the death of Wilhelm's mother in February 1845, his father re-married (Marie Ehrlich) in January 1850 and had another child, Bernhard (Bernard) Steinitz (1850-1892) at the age of 61. Wilhelm Steinitz may have learned chess while living in a Prague ghetto in 1848, at the age of 12. Various sources say that he learned chess from his father (who played chess), or a friend of his father, or a school mate. Some sources (Devide) say that he carved his first chess pieces himself out of kindling wood and used a checkerboard cloth for his chess board. Steinitz may have gone to Jewish school in the Prague ghetto where he received instruction in Hebrew grammar and in biblical studies. Some of his ancestors were scholars of the Talmud and his parents wanted Wilhelm to also be a Talmud scholar and a rabbi. In 1849, at the age of 13, Wilhelm Steinitz was acknowledged the best Talmudist among the young men of Prague. His parents wanted him to attend the 'Yeshiva,' the high school for the study of the Talmud. However, he became more interested in mathematics and wanted to complete his studies in Vienna. This may have caused a break between him and his parents. Another contributing factor may be that his father was on his second marriage and he may have had a bad relationship with his step-mother, Marie. Also, his father may not have approved young Wilhelm playing chess. One source mentions that Steinitz attended the Volksschule in Prague where he had a gift for mathematics. By 1849, the law that forced Jews to live in the Prague ghetto was rescinded. Jews could now move freely throughout Prague as long as they had a passport. Soon, most of the Jews left this area, leaving only orthodox and poor Jews in the quarter. In 1850, the Prague ghetto had disappeared and was renamed Josefstadt. Steinitz, at the age of 15, left his parents and lived for a time on the streets of Prague. He worked as a clerk and an office worker in various small businesses in and around Prague. In 1853, Steinitz met Josef Popper-Lynkeus (1838-1921), who was an Austrian scholar, writer, engineer, and social reformer. He was also the author of several technical treatises. Popper encouraged Steinitz to move to Vienna to study mathematics. They were friends for life. In 1855, Wilhelm Steinitz was living on his own in Strakonici, 68 miles southwest of Prague. On June 30, 1857, Steinitz applied for a passport (good for one year) and received one, but did not use it. He applied for a second passport after the first one expired. In October 1857, the Vienna Chess Society was formed and Steinitz became a member in the late 1850s, which provided him with financial support from time to time. On July 6, 1858, Wilhelm Steinitz, age 22, was issued a second Austrian passport and soon left the Prague area for Vienna. He continued to use an Austrian passport until he became an American citizen. Steinitz moved to Vienna in 1858, and by autumn, he enrolled in the Vienna Polytechnicum as a mathematics student. Under the heading "Preparation," Steinitz claimed 3 years of private tutoring. Steinitz later dropped out of school after the first year. Some sources say he dropped out because of insufficient funds and poor health (he had problems with his lungs and eyes). His school records show that he was dismissed for "lack of progress and failure to take exams." Money was hard to come by in those days, and Steinitz was so poor and desperate that he even contemplated suicide. Around 1858, Steinitz met Philipp Meitner (1839-1910), an Austrian lawyer and father of the physicist Lise Meitner (1878-1968). Meitner was also one of the best chess players in Vienna. Both were fellow students at the Vienna Polytecnic. Steinitz and Meitner played several tournament games against each other. In 1858, Steinitz made his first appearance in the Cafe Rebhuhn (partridge) in Vienna. When asked if he played chess, Steinitz said yes, and that he could even play blindfold. The challenge was met when Steinitz took on two players from the cafe and defeated both of them without sight of the board. The Cafe Rebhuhn was Steinitz's preferred coffee house for chess. In 1858, Steinitz started hustling chess at the Cafe Romer and played most of his opponents blindfolded for money. He also established his reputation as one of the strongest chess players in Vienna. He was soon called "The Austrian Morphy" for his sharp gambits and good play. By 1859, Steinitz was giving blindfold chess exhibitions at the Cafe Romer, the Cafe L'Express, the Cafe Central, and the Cafe Rebhuhn. He was a member of the Vienna Chess Society and called himself a professional chess player. His earliest known chess games date from 1859. He took 3rd place in the 1859 Vienna championship (Wiener Schachgesellschaft), won by the Swiss player Carl Hamppe (1814-1873), who was a senior government official in Vienna. Steinitz soon took chess lessons from Hamppe, who was one of the best chess players in Vienna. In 1860, he joined the staff as a journalist of one of the leading Vienna papers, but the state of his eyesight compelled him to give that up. Steinitz had the job of report parliamentary activities for the "Constitutionaelle Osterreichische Zeitung." In 1860, Steinitz took 2nd place in the Vienna championship (again, won by Hamppe). He won an elegant crafted chess table and an English chess set. In 1861, and won the Vienna championship with the score of 31.5 out of 34 (30 wins, 3 draws, and 1 loss). His first place prize was a suitcase. He was the acknowledged champion of Austria. Some of his opponents who were also chess patrons included the wealthy banker Gustav Leopold Ritter von Epstein (1828-1879) and railroad baron Josef Schulhof (1824-1890). Steinitz also gave chess lessons, and one of his pupils was Baron Albert Salomon Anselm Rothschild. Steinitz sometimes made as much as $100 in one sitting of a few hours to give lessons to some of these patrons. Steinitz called Schulhof the most generous private patron he had ever met. In 1861, Steinitz still had an interest in mathematics, mechanics, and physics and attended lectures by the Austrian physicist Ernest Mach (1838-1916). Some of the lectures were titled, "Investigative methods in Physics" and "The Principles of Mechanics and Mechanical Physics." Steinitz later began to apply scientific principles to chess and applying it to chess theory. 1862 Steinitz, age 26, was invited to play in the second international tournament (the first was London 1851) in London, held during the second British world exhibition. The event was sponsored by the British Chess Association. Steinitz had a number of letters of introduction from Austrian well-wishers, but he never opened or showed these letters to anyone, as he was too proud of a man to want to feel indebted to anyone. He traveled to London and played in his first international tournament (held from June 16 to August 2, 1862). He was the Austrian delegate to the tournament and was sponsored by the Vienna Chess Society under the patronage of Viennese banker Eduard von Todesco (1814-1887). The tournament was played at the St. George's Club, St. James Club, and the Divan. It was a 14-person all-play-all event, and the first major tournament with time controls. 24 moves had to be played in 2 hours. Time was measured with hourglasses. Steinitz took 5th-7th place (out of 14) behind Adolf Anderssen, Louis Paulsen, John Owen, George MacDonnell, and Serafino Dubois. His score was 8 wins, 5 losses (draws did not count and had to be replayed). His prize money for 6th place was 5 British pounds sterling (equivalent in today's money of 420 pounds or about $533). His win over Augustus Mongredien (1807-1888), a Center Counter game, was recognized by many as one of the most brilliant games ever played. He sacrificed his rook and later forced mate. In those days, there were 12 pence (plural of penny) in a shilling, 20 shillings or 240 pence in a pound (or sovereign). A guinea was 21 shillings. Two shillings was known as a florin. 5 shillings was a crown. 1 British pound in 1862 is worth 84 pounds in 2016. 1 British pound today is $1.27. 1 British pound in 1862 would be worth $107 today. After this tournament, he remained in London and challenged the 5th place finisher of the London International, Serafino Dubois (1817-1899), to a match. Steinitz won (5 wins, 1 draw, 3 losses) and earned the equivalent of 100 marks. After the tournament, Steinitz decided to stay in London as a professional chess player, even though he knew little or no English. Steinitz spoke German and Yiddish. He won the London championship in September, 1862 with a perfect 7-0 score. He was given the nickname of 'the modern Calabrese' by the English master George Walker. This was in reference to Greco of Calabria. In 1862, chess was Steinitz's main source of income and he was the resident chess pro at the London Chess Club. However, as a foreigner and a chess professional, Steinitz was not allowed to play in several English competitions. He made his money by giving chess lessons and playing chess games for small stakes in the coffee houses. In December 1862- January 1863, Steinitz played a match with Joseph Henry Blackburne (1841-1924) in London. Steinitz won the match with 7 wins, 2 draws, and two losses. The stakes were 10 British pounds. After this match, Steinitz would not lose another match until 1894, when he lost to Emanuel Lasker in the 1894 World Chess Championship match. From 1863 to 1894, 31 years, Steinitz played 29 matches, winning 27, losing one, and drawing one (to Szymon Winawer in 1882), for the best record of match play by any world chess champion. Steinitz became a chess professional after this tournament. By the end of 1862, Steinitz, age 26, was ranked #5 in the world, behind Louis Paulsen, Adolf Anderssen, Ignatz Kolisch. In 1862/63, Steinitz defeated London's best player, Henry Blackburne (1841-1924), in a match in with 7 wins, 2 draws, and 1 loss. In March, 1863, Steinitz apologized in a letter (dated March 20, 1863) to Ignac Kolisch (1837-1889) for not repaying a loan. While Steinitz was playing a match with Blackburne, Daniel Harrwitz took over as the resident chess pro at the London Chess Club, leaving Steinitz with fewer clients to draw money from. He traveled throughout the British Isles giving simultaneous exhibitions and winning tournaments. In 1863 he defeated Frederick Deacon (1829-1875) and Mongredien, two top English masters. In 1864, he defeated Valentine Green 7 to 0, with 2 draws. Around 1865, Steinitz married ("common law" wife) Caroline Elizabeth Golder (born in 1844). They had a daughter, Flora, born at St. Lukes, Middlesex, on August 7, 1866. They were probably not married in the traditional manner, as wedding ceremonies were hard to arrange between a Jewish and a Christian partner, and such marriage arrangements were shunned by the religious groups. Soon, the Steinitz family was living at 63 Baldwyn Street, County of Middlesex. In September 1865, Steinitz visited Dublin, Ireland and played in the Irish Chess Congress. He won the Irish championship in Dublin in October, 1865, and spent 3 weeks in Dublin. At the end of his stay in Dublin, he was giving blindfold exhibitions. In one exhibition, he had 5 opponents, in which he won 4 and drew 1. In June-July, 1866 Steinitz won the London Knockout tournament with 8 wins, 3 draws, and no losses. He won the British Chess Association Congress held in London with 12 wins. On July 18, 1866 Steinitz took on Adolf Anderssen (1818-1879), age 48, in London, considered the strongest active chess player in the world. Play was to the first to win 8 games, draws not counting. The match was co-sponsored by the Westminster Chess Club, the London Chess Club, and St. George's Chess Club. Anderssen came to London during his break from his teaching duties in Breslau. Anderssen taught mathematics and the German language. The first game was played in the rooms of the Westminster Chess Club, then located at Gordon Hotel, Covent Garden, London. On August 7, 1866, Steinitz's daughter, Flora, was born. Steinitz still turned up punctually for his match with Anderssen. Steinitz did not want to delay the match as Anderssen might be under pressure to return to Breslau for his teaching duties, as he did in his match with Paul Morphy and Louis Paulsen. Also, he did not want to be late as there was a fine of one guinea for each 15 minutes that you were late. Steinitz defeated Anderssen on August 10, 1866 with 8 wins and 6 losses. The last game lasted 85 moves. There were no draws. After 12 games, the score was 6-6. Steinitz won the last two games to win the match. This was the first match that ever used mechanical clocks (sandglasses). The time control was 20 moves in 2 hours. Steinitz's prize money for this match was 100 pounds sterling (over 8,300 pounds today, or $10.500 in today's currency). Anderssen received 20 pounds sterling. The money was put up by R. T. Forster for Steinitz's stake, while several members of the Westminster Club put up the stakes for Anderssen. In September, 1866, Steinitz played a match in London with one of England's top players, Henry E. Bird (1830-1908). Steinitz defeated Bird with 7 wins, 5 draws, and 5 losses. In 1867, Steinitz was elected Honorary Member of the City of London Chess Club (founded in 1852). In 1867, Steinitz got in a dispute with Henry Blackburne at a City of London Chess Club game. Blackburne made an insulting remark and Steinitz spat towards Blackburne. Blackburne, who was over 6 feet and 250 pounds, then smashed the diminutive Steinitz in the face with his fist. Steinitz later wrote, "—he struck with his full fist into my eye, which he blackened and might have knocked out. And though he is a powerful man of very nearly twice my size, who might have killed me with a few such strokes, I am proud to say that I had the courage of attempting to spit into his face, and only wish I had succeeded." In June 1867, Steinitz traveled to Paris where he took 3rd place (Ignac Kolisch took first, followed by Winawer). In this 13-player strong event, Steinitz got in an argument with Blackburne. Steinitz finally spat on Blackburne and Blackburne punched out Steinitz. In September 1867, Steinitz took second place in the Dundee International in England (won by Neumann). This was the first tournament in which draws were not replayed, but counted as a half a point. In 1868 Steinitz traveled to Germany where he took 2nd place in the 7th German championship (Anderssen was first). He then returned to London where he won the 1868 London Handicap. In 1869 Steinitz defeated Joseph Blackburne in a match and won 6 pounds. Steinitz also won a Handicap tournament in London. In 1869, Steinitz tutored chess at Oxford and one of his students was Winston Churchill's father, Lord Randolph Churchill (1849-1895). Steinitz helped organize the Cambridge-Oxford chess matches which began in 1873 and still continues today. Lord Randolph Churchill was a founding member of the Oxford University Chess Club. In August 1870, he took 2nd place at Baden-Baden, won by Anderssen. Steinitz scored 9 wins, 3 draws, and 4 losses and missed tying for first by 1/2 point. He played Anderssen twice, losing both games. The 1870-1871 Franco-Prussian War between France and Germany limited chess activities on the continent. Steinitz was getting too strong for British competition. In 1871, Steinitz gave his occupation as "professor of chess." He shared an apartment house with a bricklayer and a machinist. In 1871, he won the City of London club handicap tournament. In 1871, several English chess patrons offered Dr. Johannes Zukertort (1842-1888) of Berlin travel expenses to come to London. They saw Zukertort, who recently defeated Adolf Anderssen in a match, as a possible rival to Steinitz. Zukertort became a member of the St. George's Chess Club and was an honorary member of the City of London Chess Club. At the Second British Chess Association Championship, held in London in July, 1872 Steinitz took first place with 7 wins and 1 draw. Blackburne took 2nd place, followed by Zukertort. This was the first victory for Steinitz in a major tournament. In August, 1872 Steinitz played a match against Zukertort in London. Steinitz won decisively with 7 wins, 4 draws, and 1 loss. This was the first time that time pieces were used in a match. In 1872, Steinitz participated in the first telegraph match between London (St. George's Chess Club) and the Vienna (Vienna Chess Club, headed by Kolisch). It was completed in 1874, with London, headed by Steinitz, winning the match with one win and one draw. In early 1873, Steinitz was giving chess lessons to Richard D. Blackmore (1825-1900), author of Lorna Doone. From June to August, 1873, Steinitz played in an international tournament in Vienna called the Emperor's Cup, winning 18 games, drawing 5 games, and losing one. Almost everyone now conceded that Steinitz was the strongest chess player in the world. His first place prize money of 200 ducats was presented to him by the Austrian Emperor. 2nd place went to Blackburne, followed by Anderssen. Between 1873 and 1882, Steinitz played no chess tournaments and only one match. In 1876 Steinitz defeated Blackburne in a match held in London with a perfect 7-0 score. Steinitz did give simultaneous and blindfold chess exhibitions during this period, which provided him with some income. From early 1873 to August 1882, Steinitz was a chess columnist for the weekly English magazine, the Field (first published in 1853), which was Britain's leading sports newspapers. J. H. Walsh was the chief editor. He also played chess for money in the London coffee houses when he wasn't banned from them. In 1874, Steinitz was a contributing editor of the City of London Chess Magazine, edited by William Norwood Potter. In March 1874, Steinitz was a spectator at the annual Oxford-Cambridge match, along with Howard Staunton (1810-1874). In 1875, the City of London Chess Club organized a new club called the West End Club in New Coventry, in which Steinitz was a member and elected to its provisional committee. The City of London CC opposed honorary members from being on the committee, since they were not dues paying members. When the City of London CC did not recognize the West End Club election, Steinitz quit the City of London Chess Club. In late 1875, Steinitz gave a bad book review of The Chess Openings by Robert Wormold. Wormold was a popular person in the chess world and among journalists, so Steinitz made enemies among a large part of the chess community. From February 17 to March 2, 1876, Steinitz played his third match with Joseph Blackburne in London and made a clean score of 7 wins, no losses or draws. The match was played at the West End Chess Club. This was the first time spectators were charged and entrance fee (half a guinea) to see a chess match. The stakes were 60 British pounds a side. Time control is 30 moves in 2 hours, followed by 15 moves per hour. Time was regulated by alarm time-pieces and not sand-glasses as stated in the original conditions of the match. Blackburne blamed his loss on an acute attack of rheumatism. In 1876, Steinitz annotated the games he played against Blackburne and wrote a book on the match, dedicating the collection of games to R. D. Blackmore. After this match, Steinitz did not play any serious chess for 6 years. He did give simultaneous and blindfold exhibitions during this period. The games were also annotated in The Field. In 1876 Steinitz began a chess column in the London Figaro, which lasted until 1882. The magazine was owned by Napoleon III. In early 1877, Steinitz was suffering from a nervous affection which affected his memory and incapacitated him from mental work. By the summer of 1877, he seems to have recovered from his nervous breakdown. In September 1877, the West End Club closed and the Divan took Steinitz off the free list after an earlier argument at the club. Steinitz refused to play at the Divan until the matter of his honorary free membership was resolved. At a tournament in Paris in 1878, Blackburne returned to the hotel drunk and got in a quarrel with Steinitz. Steinitz wrote, "and after a few words he pounced upon me and hammered at my face and eyes with fullest force about a dozen blows—But at last I had the good fortune to release myself from his drunken grip, and I broke the window pane with his head, which sobered him down a little." In 1879, Zukertort and Leopold Hoffer (1842-1913) founded The Chess Monthly, which became involved in heated debates with Steinitz many times. From 1880 to the end of 1881, Steinitz was invited to Lord Randolph Churchill's estate at Blenheim Palace in Woodstock to play chess and give him chess lessons. He met Lady Churchill (Jennie) and discussed politics with Lord Randolph. Winston Churchill was 6 years old at the time. In July, 1880, Steinitz visited Wiesbaden, Germany to report on an international tournament, held July 4-11. The tournament saw a three-way tie between Blackburne, Berthold Englisch, and Adolf Schwarz. In 1881, Steinitz gave his occupation as "journalist." In 1881, Steinitz got in a major feud with Leopold Hoffer, the chess column successor in The Field. This feud became known as the 'Steinitz-Hoffer-Ink-War.' Steinitz mercilessly criticized Hoffer's annotations of chess games in his column. In May-June 1882, Steinitz tied for first place (with Szymon Winawer) at the Vienna International with 20 wins, 8 draws, and 6 losses (24 out of 34 points). This was an 18-player double round robin. This tournament was described as the strongest chess tournament of all time at that point. It was Steinitz's first tournament in 9 years. During the Vienna tournament, Steinitz was sending weekly reports on the tournament to The Field. Just after the end of the tournament, The Field published an anti-Semitic article by Hoffer that praised the efforts of the English players and those of English origin in Vienna, but disparaged the victory of the two Jewish players, Steinitz and Winawer. Until his first loss in this tournament, Steinitz did not lose a game from August 4, 1873 to May 11, 1882, almost 9 years without a loss and 25 straight wins. He won his last 14 games at Vienna in 1873, and then beat Blackburne 2-0 in the play-off. Then he beat Blackburne in a match 7-0 in 1876, and then won his first two games at Vienna in 1882. Steinitz and Winawer then had a 2-game play-off match, which they drew by winning one game each. In late 1882, the publisher of The Field closed down Steinitz's chess column after Steinitz quarreled with the publisher about the anti-Semitic article written by Hoffer. After London, 1883, the publisher brought back the chess column, but under the authorship of Hoffer and Zukertort. Steinitz was banned from several London coffee houses due to his temperament and he lost most of his regular income. From November 1882 to May 1883, Steinitz visited the United States, mainly the Philadelphia area (Franklin Chess Club) at the invitation of David Thompson. He was given an enthusiastic reception. Steinitz played several chess exhibitions, many casual games, and a match for stakes of 50 pounds with a wealthy amateur. He also won serious matches against Alexander Sellman and the Cuban champion Celso Golmayo Zupide. The match with Golmayo was abandoned when Steinitz was leading (eight wins, one draw, and one loss). His hosts also arranged a visit to New Orleans, where Paul Morphy lived. When Morphy was informed that Steinitz was in New Orleans, he is said to have replied: "I know — his gambit is bad." In January, 1883, Steinitz met Paul Morphy (1837-1884) in New Orleans. Steinitz interviewed Morphy for about 20 minutes. His experience with Morphy was published in the New York Tribune on March 22, 1883. On March 6, 1883, William Steinitz was made an honorary member of the Manhattan CC. In June 1883, Steinitz took 2nd place at London, three behind Johannes Zukertort. Steinitz had 19 wins and 7 losses. This was the first time double chess clocks were used in a tournament. 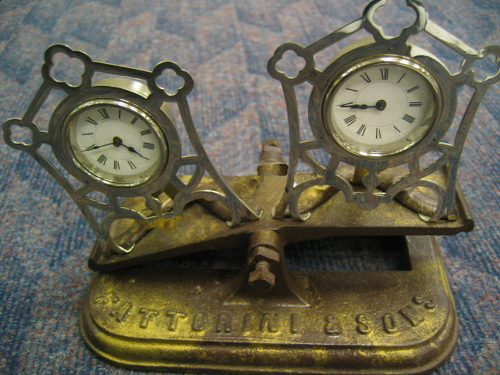 The clocks, devised by Thomas Wilson of Manchester, were mechanical chess balances, combining two pendulum clocks with a mechanism to stop one and start the other. After the tournament a reception was held at the St George Chess Club. Someone made a toast to the best chess player in the world. Both Steinitz and Zukertort stood up. Neither one yielded to the other. From July 6 to September 7, 1883, he edited a chess column in a short-lived new British magazine Ashore or Afloat. In September 1883, he resigned his honorary membership of the St. George's Chess Club after claiming the club's committee favored Zukertort over himself. The chess community thought that a 'World Championship in Chess' match should be held between Steinitz and Zukertort to see who was the best chess player in the world. Steinitz suggested a stake of 200 pounds or more for the match, consisting of 8 to 10 games. Steinitz wanted to play the match between October 1883 and January 1884. However, Zukertort declined the dates as he said that he had commitments during that period and did not agree to an immediate start of the match. Also, Zukertort was suffering from health problems during that period, and his doctor advised him not to play any serious match or tournament. Steinitz was the target of anti-Semitic abuse in England, and moved to the United States to escape this. In October, 1883, Steinitz immigrated to the United States, changed his first name from Wilhelm to William, and eventually took American citizenship. Steinitz first resided in Brooklyn. In 1884 Steinitz was giving blindfold, simultaneous exhibitions. He would even play cards between moves while doing his exhibitions. On July 10, 1884, Paul Morphy died. That meant that either Steinitz or Zukerort could now claim to be world chess champion. In 1884, Zukertort came to the United States for a simultaneous exhibition tour. Steinitz renewed his offer with Zukertort for a world championship match, but Zukertort declined. On November 27, 1884 (Thanksgiving Day), William Steinitz played 22 players at the Manhattan Chess club, winning 21 and drawing one game. There were several hundred visitors to the exhibition. In January, 1885 Steinitz began editing the International Chess Magazine, which he continued to do so until December, 1891. 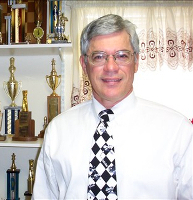 He also wrote chess articles in the New York Tribune and the New York Herald. In April 1885, Steinitz first asked Gustav Simonson, then Thomas Frere to be his second and work on the preliminary negotiations for a world championship match with Zukertort. Zukertort's second was Mr. James Innes Minchin, secretary of the St. George's Chess Club in London. He was later replaced by Charles Mohle. Back in England, Zukertort was claiming he was the world's best chess player because of his victory in the London 1883 tournament. Steinitz again challenged him to a match and they both agreed that the first person to win ten games would be declared world champion, but that if each won nine games, the title would not be awarded. The contract for the match said it would be "for the Championship of the World." In July 1885, Zukertort suggested that the referee for the match should be Charles Francis Buck, president of the New Orleans Chess Club. Many of the conditions of the match were published in the 1885 issues of Chess Monthly. The original time control that Steinitz proposed was 24 moves in the first 2 hours, and 12 moves per hour thereafter. Zukertort wanted 30 moves in 2 hours. The original cities for the match were New York, Baltimore, and New Orleans that Steinitz proposed. Zukertort originally wanted a match of up to 25 chess games. Zukertort wanted to play the entire match in New Orleans. Zukertort wanted to start the match in October, 1885. In November 1885, the Manhattan Chess Club raised $1,000 as contribution to the stakes of the Steinitz-Zukertort match, stipulating only that a portion of the games played in New York would be at the Manhattan Chess Club. The contract for the world championship match was finally signed on December 29, 1885. At Steinitz's insistence the contract said it would be "for the Championship of the World." Throughout the match, rumors abounded in various newspapers that the long delay in the match was on purpose and designed to increase the sale of tickets. There were also rumors that there was collusion between the two players as to the outcome of some games. On January 11, 1886 the first game for the official world chess championship began in New York. The first five games were played in New York from January 11th through 20th, 1886. Games 6 through 9 were held in Saint Louis from February 3rd through February 10th. Games 10 through 20 were held in New Orleans from February 26 through March 29, 1886. The best of 10 wins. In case of 9 wins for both players, the match is equal (This was later lowered to 8 wins for both players). It was Zukertort who challenged Steinitz for the world championship. Zukertort must have been fully aware of the risk to his health that such a match must entail. In the first place, the match would be of long duration, for the victor would be the first person to win 10 games, draws not being counted. That wouldn't have been healthy for Zukertort. Secondly, the match was due to be played in three different places: New York, St. Louis, and New Orleans. The climate of St. Louis and New Orleans were considered to have climates troublesome to Europeans. Finally, there was the fact that Zukertort's health had already once before broken down under the strain of a long tournament. This match would be no different. Steinitz wanted the U.S. flag to be placed next to him during the match, even though he still was an Austrian citizen (he became an American citizen almost three years later). Less than 40 people were present at the start of this historical match, despite Steinitz's daughter, Flora, selling programs and photographs to earn a few extra dollars for the family. Steinitz couldn't even afford a winter coat for her daughter. From January 11 to January 20, 1886, the Manhattan Chess Club hosted the 1886 world championship between William Steinitz and Johannes Zukertort. The beginning of the match was played at the Dancing Academy in Cartier's Hall at No. 80 5th Avenue and Ninth Street in Manhattan. Admission fee was $1 a day. The time control was 30 moves in 2 hours, with a 2 hour dinner break, then 15 moves an hour. Steinitz and Zukertort agreed to play the match in New York, St. Louis, and New Orleans. The first 5 games in New York were disastrous for Steinitz. Although he won the first game, he lost the next 4 games in a row and was trailing the match with 1 win and 4 losses. The match was the first time a chess demonstration board was used. The demonstration board was run by master George Mackenzie. During this period, Steinitz wrote in the New York Tribune "I would rather die in America than live in England." A contract was made and play was for the championship of the world and $2,000 a side. The match was played in New York until one party won four games. They would play in St. Louis until one party won three more games. It would then be finished in New Orleans. The games were played on alternate days. If both parties won 9 games, the contest would be declared drawn. The time limit was 30 moves in 2 hours, then 15 moves per hour afterward. Play began at 2 pm and would last until 6 pm, if necessary. It would then resume for 4 more hours at 8 pm. Play began on Tuesday, January 11, 1886 in in one of Cartier's rooms, a dancing academy, at No. 80 5th Avenue. Mr. Mohle decided the first move in Mr. Zukertort's favor by the toss of the copper penny. The coin was enhanced in value a thousand fold as it flew through the air, $5 being bid for it as a souvenir before it reached the floor. One newspaper clipping, dated January 11, 1886, had an article on Steinitz's daughter who had a stand and was selling her father's photographs for 50 cents. She was also selling pocket chess sets and chess magazines. The chessboard and pieces in New York were the same one used by Paul Morphy and Louis Pualsen during the first American Chess Congress in 1857. Among those present in the New York crowd included George T. Green (Manhattan Chess Club President), F.M. Teed, and W.M. De Vissar, of the Manhattan Chess Club; W.S. Paterson, Capt. Mackenzie, Charles F. Buck of New Orleans (referee), Dr. J.N. Navarro, Mexican Consul-General; W.J.A. Fuller, one of the earliest newspaper chess editors; Rev. J.H. Fitzgerald of Newark; Samuel Loyd, President of the New York Chess Club; and George H. Peabody. The selection of the White pieces was made by a penny toss, and Zukertort won the White pieces in the first game. Steinitz sealed his 32nd move, and the players recessed for dinner. During the match, Steinitz puffed away on his cigar and every now and then, took a sip of a small brandy that was on his table. The admission tickets for the match were 50 cents at all three sites. The tickets said the play would be on Mondays, Wednesdays, and Fridays from 2 pm to 6 pm, then 8 pm to midnight. Season tickets were $5. At the time, there was no draw by repetition rule for 3 repeated positions. Two games could have drawn (game 6 and 11) if that rule was in place. The games of the match were governed by the codes of laws published in the last edition of the German Handbuch, with the exception, that, if both players repeat the same series of moves 6 times in succession, then either party could clam a draw. For the first time in an important chess event, a large demonstration board was designed to be hung on the wall to cater for the needs of the spectators. Each move was also cabled immediately to Europe. Most European fans were solidly supporting Zukertort. When Steinitz won the first game, interest became so great that the playing hall could not accommodate the crowds who turned up to watch. Steinitz started badly. His supporters blamed it on his insomnia as the reason for his poor play in New York. In an interview with the New York Tribune, Steinitz said that after game 1, he spent 17 hours working on literary and analytical material for his International Chess Magazine instead of resting. Steinitz was down 1-4 before moving on to St. Louis after a 12-day break. When they arrived in St. Louis, Steinitz promptly objected to the chess board provided. The squares were red and white, explaining that he was color-blind to red. A chess board with black and white squares was substituted. Steinitz and Zukertort traveled together and arrived in St. Louis on January 30. They intended to make a short stop of a couple of hours in Baltimore to meet some friends, but by mistake failed to leave the train in that city. In St. Louis, the games started in the hall of the Harmonic Club, located at the corner of Olive and 8th Streets. At New York and St. Louis, the only means of heating the hall was located close to the players. Both complained of the high temperature. When not playing chess, both players played whist. A delay in the first game in St. Louis was due to the red squares instead of white ones. Steinitz said his eyes were so weak that he did not like the color. Somebody suggested that Steinitz has a superstition about chessboards with red squares. He considered these boards with red squares as voodoo. At 2:30, a new board with black and canary-colored squares was produced and used. The board was the property of Judge Krum and cost 4 British pounds in London. In St. Louis, the audience numbered about 200 people. Zukertort walked and chatted with the audience. In the first game in St. Louis, Steinitz proposed to adjourn the game on the account of the extreme coldness of the room. Something had happened to the steam pipes. Zukertort declined. After the first game in St. Louis, Zukertort returned to his hotel, Steinitz stayed at the hall drinking a beer and explaining his chess moves to the audience. Steinitz won 3 games and drew 1 game in St. Louis. During the match, Zukertort would pace nervously between moves, while Steinitz never left his seat. A few times, Steinitz whispered to his second or ate some chocolate ice cream by his side. During the 2nd game in St Louis (game 7 of the match), both players shook the table hard enough to spill some of the chess pieces. In game 8, played in St. Louis, the game was delayed half way through because Zukertort's clock broke. There was no spare. They had to wait for it to be sent to a jeweler's for repair. During the delay, Zukertort play Whist. The organization in St. Louis had not expected that 3 wins would happen so fast. After 3 wins in St. Louis, the players were expected to go on to New Orleans. The players now had some time before going to New Orleans, so they played whist together at the Chess, Checkers and Whist Club Harmonie in St. Louis. Finally, they went on to New Orleans. The match was held at the New Orleans Chess, Checkers and Whist Club, at the corner of Baronne and Canal streets. Steinitz consumed a great deal of coffee during the match. Some audience members were betting whether Steinitz would drink more coffee before he made his next move. In game 2 at New Orleans, Steinitz spilled his cup of coffee over the chess table during play. Several minutes were wasted while the porter made the necessary cleaning. During the match in New Orleans, Zukertort complained of insomnia and restlessness. One of the games in New Orleans was postponed because of Louisiana Day at the Exposition. The 20th game was postponed for 3 days "on account of the duly certified illness of Dr. Zukertort." The last game was over in 30 minutes. In game 20, Steinitz won in 19 moves. The game took about 20 minutes to play. Until the last championship match in 2012, it was the fastest lost in a world championship match. Steinitz won 6 games, drew 4 games, and lost only 1 game in New Orleans. He had won the first world chess championship, a title he had invented, with a score of 10 wins, 5 draws, and 5 losses. Steinitz was 49 years old (Zukertort was 43) and had been considered the unofficial world champion for the past 20 years. Between the stakes of Steinitz and Zukertort, $4,000 was collected (over $100,000 in today's currency). $3,000 was paid to those who bet on the winner. Steinitz earned $1,000 (over $25,000 in today's currency). Steinitz returned home to New York and Zukertort left for San Francisco. Steinitz continued publishing his International Chess Magazine, which ran from 1885 to 1891, with the help of his daughter Flora. However, she fell fill with rheumatic fever in 1887. Zukertort, on his return to Europe, blamed his loss on the climate. Zukertort hoped for a return match under more favorable conditions. He hoped a return match would be "not for trial of constitution, but for trial of chess skill." He never got his return match. Within two years, Zukertort, at the age of 46, was dead. On January 14, 1888, Steinitz's daughter, Flora, died of rheumatic fever in Brooklyn at the age of 21. On November 23, 1888, William Steinitz became a naturalized U.S. citizen. He had resided 5 years in New York. Also in 1888, the Havana Chess Club invited Steinitz to choose a worthy opponent and to play the next match for the world championship in Havana. Steinitz named Mikhail Ivanovich Chigorin (1850-1908) of Russia as his next opponent. The play would be to the best of 20 games. Steinitz had previously lost to Chigorin twice in the London tournament of 1883. 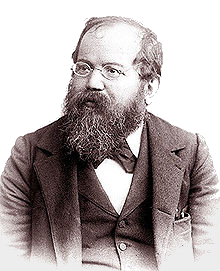 On January 20, 1889, Steinitz started his world championship title defense against Chigorin. Their match was held in Havana, Cuba. Steinitz won with 10 wins, 1 draw (game 17 - the last game), and 6 losses. The match ended February 24, 1889. Steinitz received the smallest prize fund ever for a world championship match, $1,150. After the match, Steinitz wrote that it was a match of a young player of the old school (Chigorin) up against an old player of the new school (Steinitz). There is some doubt about whether this was intended to be a match for the world championship: both Steinitz's letters and the publicity material just before the match conspicuously avoided the phrase. The proposed match was to have a maximum of 20 games, and Steinitz had said that fixed-length matches were unsuitable for world championship contests because the first player to take the lead could then play for draws. Also, Steinitz was at the same time supporting the American Chess Congress' world championship project to draw up regulations for the future conduct of world championship contests. In May, 1889 Steinitz wrote The Modern Chess Instructor, Part I and published in New York and London by G.P. Putman & Sons. The book was dedicated to the honorable R. Steel of Calcutta. The book received mixed reviews and was unsuccessful financially. A second part appeared in 1895. He spent the rest of the year writing a book on this tournament, annotating every one of the 432 games. The book was published in 1891. In 1889, Steinitz moved to Upper Montclair, New Jersey. Hedwig Steinitz (daughter of his younger Brother Bernard), his niece, lived with him Upper Montclair. She is sometimes referred to as Steinitz's adopted daughter. She was the only family member Steinitz ever mentioned in later years. In 1889, Steinitz helped organize the Sixth American Chess Congress, held in New York. He did not play in the event, but edited the book on the tournament. In 1890 Steinitz played a cable match with Chigorin in Havana from New York, but lost that match. They both were experimenting with variations in the Evans Gambit and the Two Knights Defense. In 1890, after Isidor Arthur Gunsberg (1854-1930) of England (born in Hungary) drew a match with Chigorin (both scored 9-9), Steinitz accepted a world championship match challenge from Gunsberg. In October 1890, William Steinitz played 26 games simultaneously at the Manhattan Chess Club. From October 1890 to January 1892, Steinitz conducted a chess column in the New York Daily Tribune. From December 9, 1890 to January 22, 1891, Steinitz defended his title against Gunsberg. Their match was held at the Manhattan Chess Club in New York. The arbiter of the match was Professor Isaac Leopold Rice, millionaire, president of the Manhattan Chess Club and chess patron. Steinitz won with 6 wins, 9 draws, and 4 losses. Steinitz received 2/3 ($3,000, or $80,000 in today's currency) of the total prize money ($4,000 raised by patrons), and Gunsberg received 1/3 ($1000). This was the first time a loser of a match took a share of the purse. After the Gunsberg match, Steinitz wanted to play Siegbert Tarrash for the next world championship match in Havana. But Tarrasch declined due to professional commitments as a medical doctor and too long of a voyage to Cuba for him. In March 1891, he wrote The Book of the Sixth American Chess Congress, which was held at New York in 1889. In 1891, the Manhattan Chess Club members contributed $283 to a testimonial fund raised for Steinitz to commemorate the 25th anniversary of his becoming (unofficial) world champion. In 1891 Steinitz again played Chigorin in Havana by cable and lost. Shortly afterward, the New York police arrested Steinitz as a Russian spy for using chess code over a cable. This was cleared up later on. In 1891 the St Petersburg Chess Society and the Havana Chess Club made offers to organize another Steinitz-Chigorin match for the world championship. Steinitz chose Havana to play the match. The stake consisted of $2,000. In December 1891, Steinitz was losing too much money with his International Chess Magazine, so he quit editing it after 6 years. On January 1, 1892 Steinitz, age 55, defended his title against Chigorin again and, again, played in Havana. Steinitz won with 10 wins, 5 draws, and 8 losses. The event was held at the Centro Asturiano Club. Chigorin blamed his loss on the heat. Chigorin lost the last game (game 23) by what was called the blunder of the century, allowing mate with the rooks on the 7th rank. The match ended on February 28, 1892. On May 27, 1892, Steinitz's first wife, Caroline Golder (1846-1892), died in New York of hepatitis. Steinitz himself was crippled with gout. William and Caroline had been together for 27 years. She was buried in Montclair, New Jersey. In July, 1892, William Steinitz's only brother died. In November, 1892, an accidental shooting occurred in Steinitz's house in Upper Montclair, New Jersey. His previous American secretary, Williams, accidently shot his new German secretary, Treital, in the house. Treital lost an arm. In 1893, Steinitz wrote on chess for the New York Herald. In 1893, Emanuel Lasker found sponsors in Canada for a world championship match challenge to Steinitz. At the time, Steinitz publically spoke of retiring, but changed his mind when Lasker challenged him. $3,000 prize money had been collected, with $2,250 to the winner and $750 to the loser. In the event of a defeat, Steinitz was allowed the right to a return match. The time control was 30 moves in 2 hours, followed by 15 moves in 1 hour. The match would be played in New York, and then to Philadelphia, and end in Montreal. In 1893, Steinitz married his second wife, Elizabeth (1870- ? ), and had two children by her, William Steinitz, Junior (1894- ?) and Juliet Steinitz (1898-?). The first game was played at the New York Union Square Hotel. They used the Fattorini & Sons chess clock (which now sells for over $3,000 on eBay) to time their moves. It was a cast metal and chrome chess clock. Before they moved to Philadelphia, Lasker was ahead 4 games to 2 games. Lasker then won all 3 games in Philadelphia before moving on to Montreal. Steinitz finally lost his title after winning 5 games, drawing 4 games, and losing 10 games. On May 26, 1894 Emanual Lasker became the second official world chess champion. After the final game of the match, Steinitz stood up and shouted: "Three cheers for the new world champion!" Steinitz held the official title for 8 years and the unofficial title for 28 years. Steinitz was the oldest world champion at 58 years, 10 days. Steinitz was unbeaten in match play for 32 years, from 1862 to 1894. Steinitz did offer an excuse as to why he lost the match. He said it was due to insomnia. In October, 1894 Steinitz was back playing tournaments and won the New York championship, winning 8, drawing 1, and losing 1 game. In May 1895, Steinitz published volume II of his Modern Chess Instructor. Again, it was dedicated to chess patron R. Steel of Calcutta. In July 1895, Steinitz returned to England for the first time in 12 years. He then spent 22 months in Europe, away from his second family. In July-August 1895, he participated in the Hastings International where he took 5th place (11 wins, 4 draws, 6 losses). He won the first brilliancy prize for his win against Curt von Bardeleben (1861-1924). In December, 1895, he participated in a quadrangular match-tournament in Saint Petersburg and took 2nd place, behind Lasker. He won 7 games, drew 5 games, and lost 6 games. In 1895 Steinitz wrote The Modern Chess Instructor, Part II. In early 1896 Steinitz defeated Emanuel Schiffers (1850-1904) of Russia in a match, held in Rostov, winning 6 games, drawing 1, losing 4. In July, 1896, he took 6th place at Nuremberg (won by Lasker) with 10 wins, 2 draws, and 6 losses. In August 1896, Steinitz stayed at Worishofen, a spa near Munich. He followed the Kneipp cure, which prescribed cold baths, exercise and diets. When Steinitz visited Moscow in the middle of winter, he still insisted on cold baths, which he did all his life. From November 1896 to January 1897, Steinitz played a return match with Lasker in Moscow. Steinitz won only 2 games, drawing 5 games, and losing 10 games. This was the last world chess championship for the next 11 years. Shortly after the match, Steinitz had a mental breakdown and was confined to a Moscow Sanatorium (Korsakov Clinic) for 40 days against his will. He played chess with the inmates. In February, 1897, the New York Times prematurely reported Steinitz's death in a New York mental asylum. In May 1897, Steinitz sailed back to New York on the Pennsylvania. In 1897, Steinitz dedicated a pamphlet to the memory of his first wife and their daughter. In August, 1897 Steinitz tied for first place in the New York State Championship. He then went on to Vienna where he played 22 games simultaneously blindfolded, winning 17 games. He was 61 years old. Soon after, he developed heart trouble (mitral stenosis) and had periods of irrationality and delusions. Some sources say that Steinitz contracted syphilis. In May 1898, Steinitz returned to Europe to play in two large tournaments at the age of 62. In May, 1898 Steinitz came in 4th place in Vienna (won by Tarrasch) where most of the world's best players were competing. In August, 1898 he took 5th at the 11th German Chess Federation Congress in Cologne, winning 8, drawing 3, and losing 4 games. His last tournament was London in June, 1899. He took 11th place and it was the first time he had not won any prize money since 1859. For 40 years he had been in the top places of every tournament he had ever played. Steinitz was now 63 and in very poor health. In October 1899, upon returning to the U.S. on the ocean liner "Oceanic," Steinitz was making claims that he could move chess pieces at will by emitting electric currents, that he could place a silver box to his ear and talk with friends overseas, and that he was trying to contact God, offering odds of a pawn-and-move in a match. In 1900 his wife committed him to the insane asylum at Ward's Island, New York. Hans Kmoch claimed that Steinitz contracted syphilis, which was the cause of his mental breakdowns he suffered in his last years. During his stay at the hospital, Steinitz's second family used their last savings to buy a candy store on West 26th Street in Manhattan. In January 1900, Steinitz published a pamphlet called "Capital, Labor and Charity." Steinitz discusses anti-Semitism, ESP, and the writings of Josef Popper. He wrote about the poor state of laborers and suggested voluntary taxation to help the poor. On August 12, 1900 William Steinitz, former world champion for 28 years, died of a heart attack in the Manhattan State Hospital at Ward's Island, New York. In September he was buried in a pauper's grave. The German Press Club, which Steinitz was a member, made the final funeral arrangements. His grave stone is written in German. Steinitz is buried at the Bethal Slope in the Cemetery of the Evergreens in Brooklyn, New York (grave number 5893). There is a memorial plaque with a relief portrait of Wilhelm Steinitz located on the side wall of the Faculty of Fine Arts of Charles University in Prague. The plaque was dedicated by the president of the Czech Republic, Vaclav Klaus on June 30, 2004. Nearby, on the border of Jewish Ghetto and Old Town in a blind alley Goldrichova, stand's Steinitz's native home. His lifetime Elo rating has been calculated at 2650. William Steinitz won 43, drew 29, and lost 43 world championship games, for a total of 57.5 points in 115 games. He was the official world champion for 8 years, despite winning every match of the best players in the world for 28 years. He played in 6 official world championship matches and died penniless. He played over 400 match and tournament games in his lifetime and won over 64 percent of his games. Steinitz played Chigorin 59 times, winning 27, drawing 8, and losing 24. Against Lasker, he won 8, drew 12, and lost 26. Against Blackburne, he won 25, drew 7, and lost 8. Against Zukertort, he won 19, drew 11, and lost 9. Against Anderssen, he won 10, no draws, and 9 losses. In September 1901, Charles Devide, chief editor of "The New York Evening Post," wrote "A Memorial to William Steinitz." It contained a selection of his games chronologically arranged with an analysis of play. One of Steinitz's maxims was: "A chess master has no more right to be ill than a general on the battlefield."